Some unexpected turbulence from stigma and ignorance on a flight from an advocacy conference. “Excuse me sir, I’m going to need to talk to you.” The flight attendant interrupted. He and another attendant pulled me off the plane and onto the boarding ramp. he began “ A passenger expressed concern about your shirt, could you explain?” Without thinking I responded I’m a Hepatitis C advocate, I just came from a conference. Noting their faces unchanging waiting for more information I continued. There’s a lot of ignorance about the disease, and a large part of that is due to stigma, so I’m not surprised someone is concerned. They asked if it was an issue. And I responded, unsure if they meant an issue for me or for them, as the situation implied they took issue. “It’s a blood borne pathogen, it’s blood to blood only,” I continued still waiting for a response I explained that I was cured last year, but regardless this shirt is my status, and it’s not an issue. I’d had enough of their concerned faces, and turned around and went back to my seat. I was far too aware of the level of control airlines have over passengers from the ticket contract, and now being a transplant patient I only had so much medication with me, so being stuck there was a concern. As a transplant patient I wear the mask to protect myself as I’m immunocompromised. As I sat back down, my anxiety manifested in sharp pains in my spine, unrelated to Hep C, but painful nonetheless. The lady I was talking with previously asked what that was all about, so I explained why they pulled me off. To which she responded “Seriously?” and I reminded her that it was just a prime example of how deep the ignorance of this disease is. Ever the advocate, I couldn’t let this sit. I wrote a lengthy Instagram, Facebook and Twitter response to @Southwest. The Southwest Twitter responded in an equally tone deaf fashion, coming to the defense of the staff. At which point I further explained the irony of ignorance now present in this of the lack of understanding. We then began a private message exchange. Again there was confusion over what the issue was, because apparently I hadn’t made myself clear. He wrongly assumed that the shirt was the issue, but in reality it’s what my shirt said and everyone’s ignorance which created this problem. 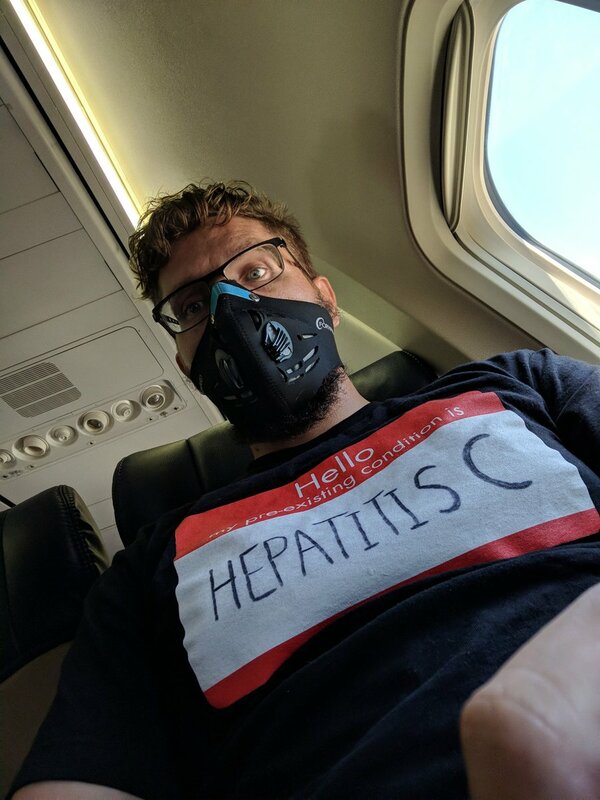 Had my shirt replaced the word Hepatitis C with AIDS, I would have never been bothered by a flight attendant. I’m not dismissing AIDS, but I’m making a point about awareness and acceptance, the crux of this whole problem. The staff would have been able to explain to the passenger who had an issue with it that they had nothing to worry about because of known transmission vectors. HIV and AIDS went through this information fight in the 80s/90s, and thankfully people are more understanding, tolerant and compassionate about the plight of those with HIV/AIDS. Hepatitis C is a younger virus, it’s only been known about since 1989, and while it infects an estimated six million Americans, and kills more than the next 60 contagious diseases combined, still little is known by the public largely because of the stigma associated with it. That stigma feeds ignorance, which in turn feeds deeper stigma and more ignorance. Explaining this cycle and these facts to every customer service person I spoke with, the chipper ticket agent, the helpful front desk supervisor, and the customer service supervisor whom I spoke with at length after waiting on the phone for forty minutes to speak to. The agents were friendly, understanding and helpful, and by the end of each conversation a little more knowledgeable about Hep C.
I explained to the customer service supervisor the only way I could see this insane cascade of ignorance which put me on a plane for five hours with flight attendants who would side with someone’s ignorant prejudice, and that mysterious someone who felt so concerned they asked staff about me, would be to educate their employees about Hepatitis C. And at the end of the day we all can agree that there is no place in the world for discrimination of any kind. According to the supervisor I spoke with, that’s the end of our conversation. So we need your help, your voice to add to the conversation. Southwest is an attentive and wonderful airline, please help by commenting, RTing and Liking, My and Former Executive Director of the NVHR Ryan Clary’s comments to Southwest. I’m certain they’ll be as responsive with y’all as they were with me.